Billy-Montigny is a commune in the Department of the Pas-de-Calais containing the two mining villages of Billy-Montigny and Montigny, the former of which is immediately South of Fouquières. 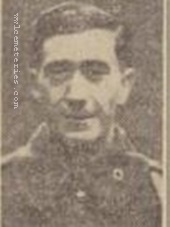 37915 Private G. T. Paget, 18th Bn. Welsh Regiment, died 19th July 1916. Lieutenant Denis Percival Beauchamp Taylor, M. C. 3rd Sqdn and 3rd (King's Own) Hussars, Royal Flying Corps, died 14th March 1916, aged 21. Son of Col. Philip Beauchamp Taylor, C.B.E.